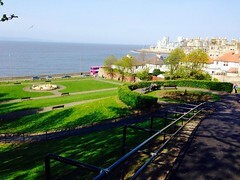 Starbank Park commands dramatic panoramas over the Firth of Forth to Fife. A great place top watch the passing ships and brightly coloured yachts. Within the park there are annual beds; one shaped in as a eight-pointed star and two crescents.These depict the ‘Star of the Sea’ believed to be symbolic of a ship’s compass and harking back to the days when Forth sailormen navigated the oceans by the stars. What makes Starbank Park special? Starbank Park is a secluded Victorian garden park on the shores of the Firth of Forth. The well maintained gardens exude peace and tranquillity and the views over the Firth of Forth to Fife and beyond are glorious. I discovered the park almost 40 years by walking round Trinity and turning into it, almost by mistake. The gardens were, and still are, a hidden gem stuck in the middle of leafy Trinity. And then there were the views. You walk down the bank from the formal gardens and you are faced by a strikingly beautiful vista. It is a glorious place to be on a sunny day. What does Starbank Park mean to you? The park condition deteriorated from the late 1990s and only a few years ago it was little short of derelict. It is wonderful how the local community has rallied round the Friends of Starbank Park and it is once again a wonderful place to be. Now, when I think of Starbank Park, I think of new friends, camaraderie, fun, good times, success, flowers and glorious views. What plans do Friends of Starbank Park have? Starbank Park is back to being a great place to go to. We have cleared the weeds (often!) and, with huge help from City of Edinburgh Council and local residents, the flower borders are all planted out. Starbank Park’s Green Flag reflects the huge improvements. The park looks good now but there is plenty room for improvement. We will retain the feel of the formal Victorian Garden Park and we are aiming for horticultural excellence in the longer term. We will improve the biodiversity by increasing the numbers of insect-friendly native plants over the years (pesticide use has already ceased). Local community involvement will be increased by holding even more regular open events in the park. A children’s nature trail will be built next year, hopefully jointly with the local school. Last and not least, we will celebrate the Park’s 125th anniversary next summer with floral displays, events and a small exhibition featuring the Park’s social history. Retaining the Green Flag award is a great way for the park to move in to its 125th year and we look forward to seeing what celebrations the Friends Group have next year. If you are interested in getting involved with the Friends of Starbank Park then check out how to become a friend.